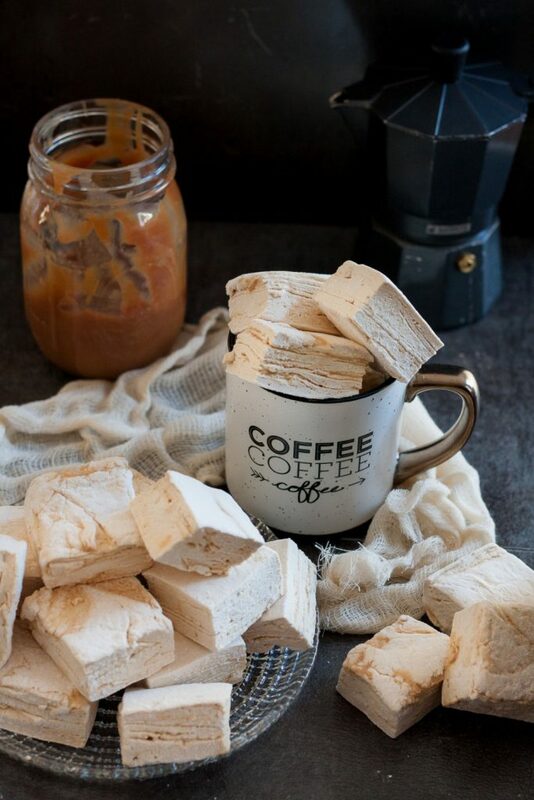 A rich caramel swirl rippled perfectly through pillowy coffee flavored marshmallows. 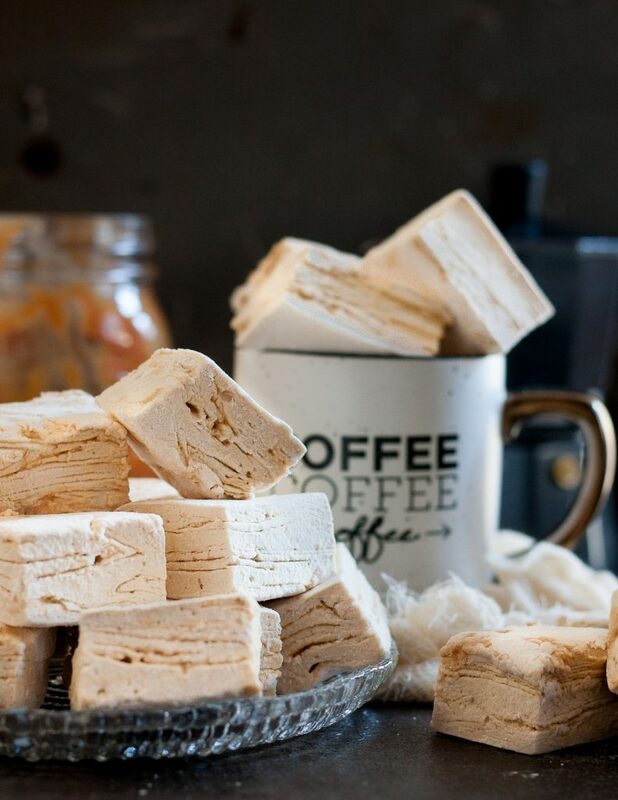 These caramel latte marshmallows are coffee-lover gourmet marshmallow perfection, and perfect to make at home. We have 4 (maybe 5?) different kinds of coffee maker in our house – not one a “traditional” coffee pot or pod coffee maker. Stove top espresso, French press, pour over, travel press mugs, all live in our small “coffee and tea” cupboard nestled between the microwave and refrigerator. A grinder and a few other accessories in there too. We do not play when it comes to coffee in this house. The funny thing is, we also rarely go over 1-2 shared cups a day. 😉 But there’s something very comforting about the smell of coffee that makes it a favorite flavor. Which is why this year, when I spotted some “gourmet” marshmallows in a store I thought, I can make that, and they’ll be coffee! I think the ones I spotted may have been vanilla, but they reminded me of the vanilla bean marshmallows I made, and that I was due to make more. Because once you get the hang of making marshmallows, you’ll want to make more. 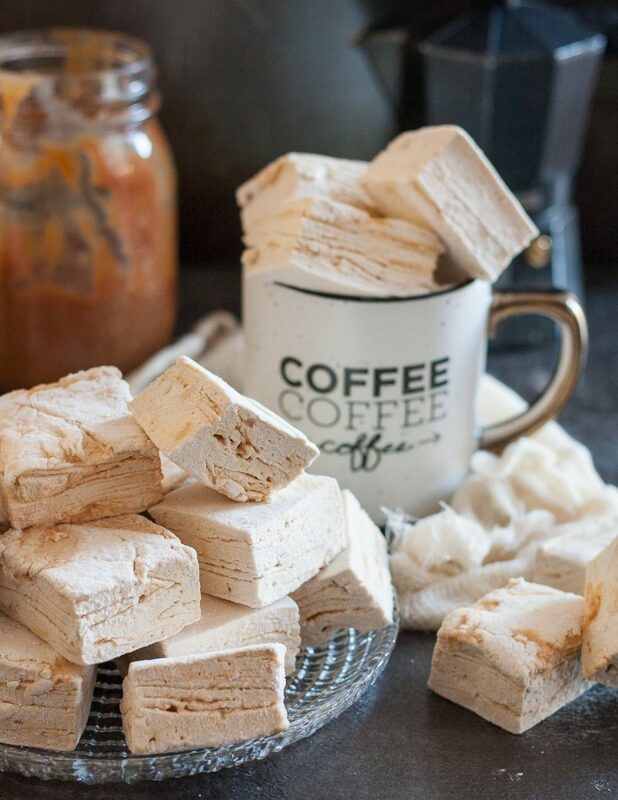 Plain coffee marshmallows just didn’t sound as fun as a coffee marshmallow based off a coffee house drink. For the longest time, my preferred flavored coffee beverage was the caramel latte. 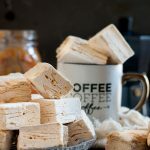 Using that as inspiration, I decided to add a caramel swirl to my espresso flavored marshmallows using the method described in this Serious Eats post. The results are specialty candy shop worthy, aren’t they? 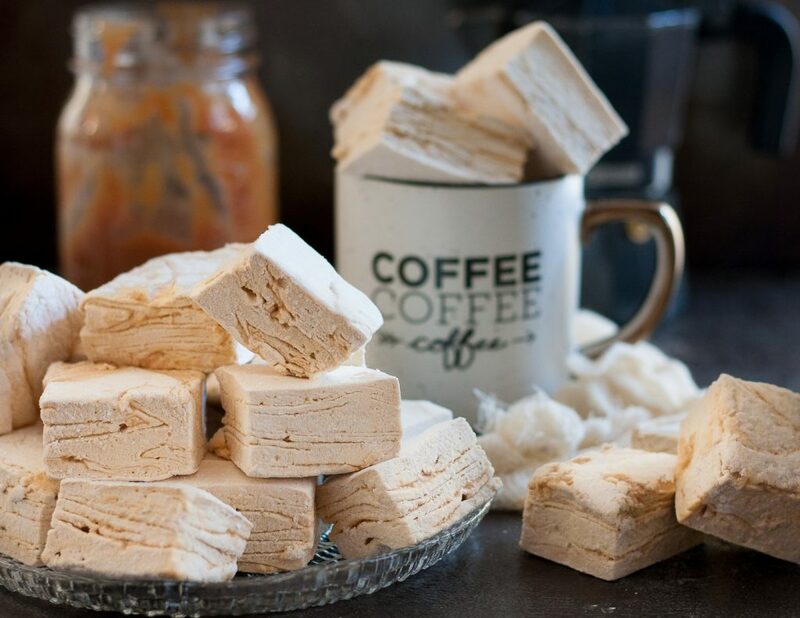 Not only are these caramel latte marshmallows stunning, the flavors are spot on. They are delicious alone, but add a beautiful compliment to hot cocoa. Dip them partially in chocolate and add a bit of sea salt for a salted caramel mocha marshmallow. And when packaged in a box or bag with a beautiful bow, they make an absolutely exquisite gift! 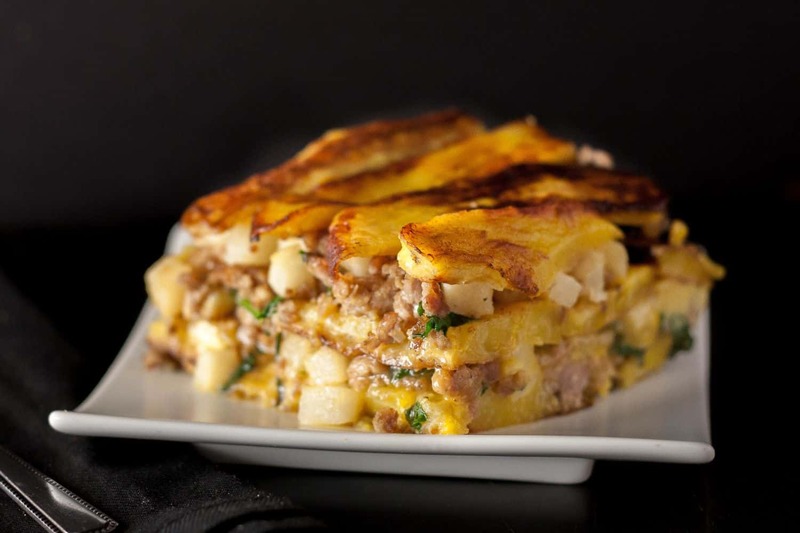 The best part is, you can make them a few days in advance, store in an airtight container, and they’ll retain their perfect texture. Enjoy! Combine the sugar, water, and corn syrup in a small sauce pan over medium heat. Stir until the sugar dissolves, brushing the sides of the pan with water if needed to prevent crystallization of the sugar. Stop stirring (swirl occasionally if needed), and increase the heat to medium high. Watch the sugar color and the moment it turns a new copper penny color, remove from heat and whisk in the heavy cream until smooth. Transfer the caramel to a heat-proof container and set aside. Put the gelatin and ½ cup of water in the bowl of a stand mixer fitted with the whisk attachment. Don't stir, just allow it to sit while you prepare the sugar syrup. Combine the other half cup of water, sugar, corn syrup, and salt in a medium saucepan with a lid. Cook, covered, over medium heat for 3 minutes until the sugar has dissolved. Uncover and clip the candy thermometer onto your saucepan. Continue to cook until the mixture reaches 240 F. This takes between 4-7 minutes. Swirl the pan gently once midway through cooking to allow for even heat distribution. Once it reaches 240 F, remove it immediately from the heat. Turn the mixer on to low and slowly pour the sugar syrup into the mixing bowl. Once all the syrup has been added, bring the mixer up to high and let it run another 8-13 minutes until the mixture is light and fluffy, and lukewarm. While the marshmallows are mixing, spray a 9x13" pan* well with nonstick spray. Combine the powdered sugar and cornstarch well, and sprinkle liberally over the pan. 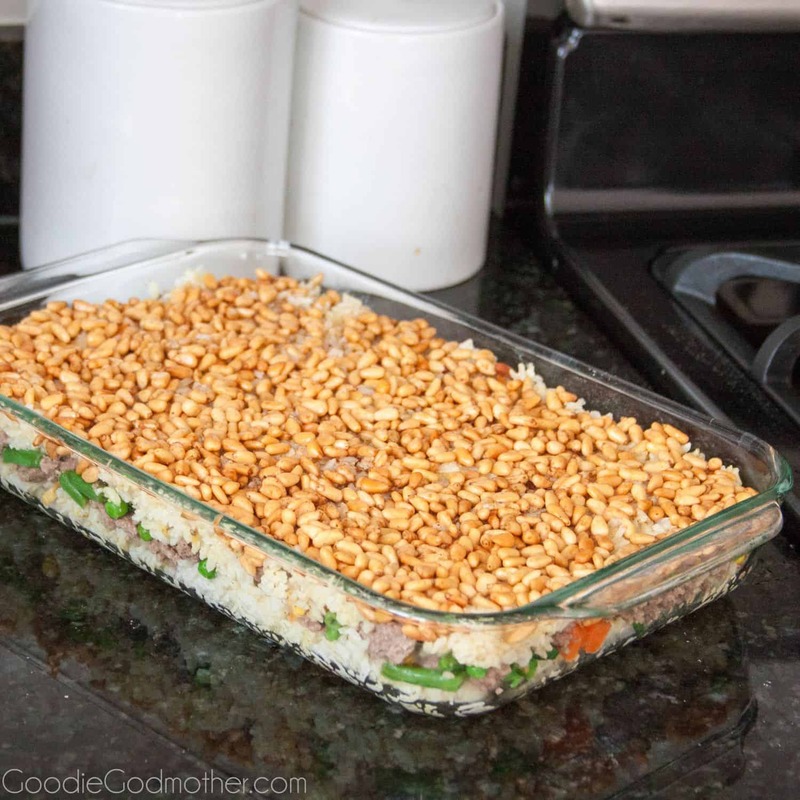 Move around to coat the pan well and then reserve the excess coating mixture to use later. Once the marshmallow is light and fluffy, add the instant espresso granules and beat another minute. Remove about 1/4 of the marshmallow mixture to a mixing bowl. Fold the caramel and removed marshmallow mixture together. Return the caramel marshmallow mixture to the mixing bowl and briefly fold into the rest of the marshmallow. Pour everything into your prepared pan and smooth using an offset spatula spritzed with nonstick spray. Sprinkle evenly with a light dusting of the coating mixture and allow to sit uncovered at room temperature 4 hours, up to overnight. To cut, use a butter knife to ensure the marshmallow isn't stuck to the edge of the pan (it shouldn't be), and flip onto a cutting board. Dust a pizza cutter with some of the coating mixture and cut the marshmallows into squares. Dab the edges of the marshmallows with the coating mixture, shake off the excess, and store the marshmallows in an airtight container at room temperature for up to three weeks. I made these last night and let them sit overnight. They came out a little wet and soft, and a little too sweet for me. But I will make them again and use more coffee flavor and less caramel, and they will be great. I can see how these would be good in a cup of coffee, instead of sugar. Yum! Could you use jarred caramel sauce instead of making it? It would be easier, and I’m not that great at caramel-making. I made these today. This was little trickier than other recipes for marshmallows. It seemed to be stickier. Any tricks on getting it into the pan to set up it stuck to everything. But the good part was they are delicious ! So so much powdered sugar and cornstarch and nonstick spray. These are definitely of the messier marshmallows I make, but they’re always a hit, so I just kind of deal with the extra clean up. And the caramel ribbons need to be super thin to help with setup. 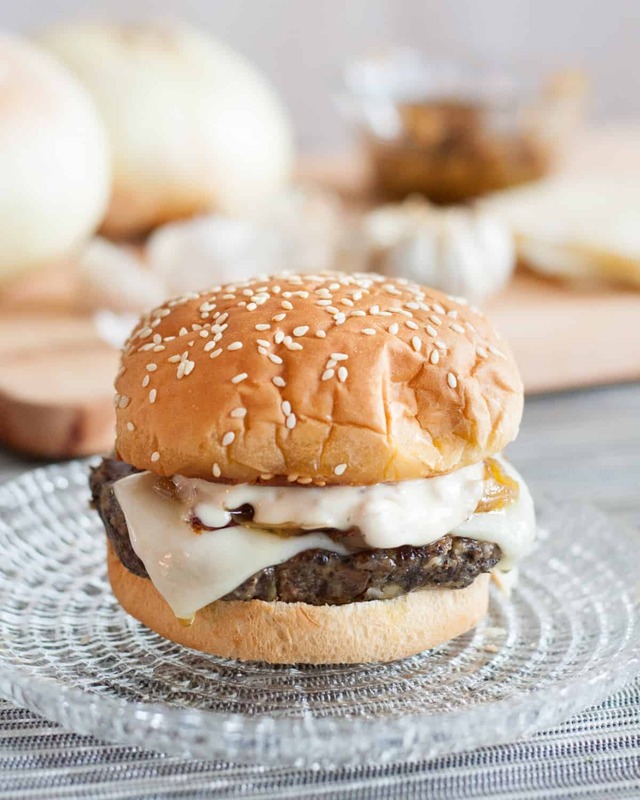 I love this idea, and look, and likely flavor, of these! These. Look. Amazing. Whether in hot chocolate, on a smore or just on it’s own, I am absolutely in love with this marshmallow!